Skill Level: Beginner, Kids ages 8 and up. 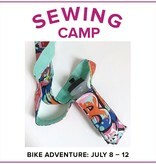 Learn to sew projects that you can bring along on summer biking and hiking adventures. Make a bike handlebar bag, and a wearable water bottle holder and more in this five-day sewing camp at Modern Domestic! You will learn many fun sewing skills and sew on a BERNINA sewing machine while gaining experience measuring, cutting, pressing, and learning how to sew. This class is intended for those ages 8 and up and is a great class for beginners. We will cover sewing machine basics - there is no previous sewing experience required! Parents: please bring a snack and water for your camper. All fabric and supplies are included with class purchase. Students will select their fabrics during class.